In our Meet an Artist series, we spoke to Sydney-based Abstract Artist Anne Spencer to learn a little about Abstract Art, its origins and myriad influences – you’ll be surprised at some of these – and importantly, how best to appreciate it. TBS: How did Abstract Art come about? Modern Art in Western culture (approximately 1860s-1970s), developed from the ideas of the Impressionists and from early abstract movements evident in the work of artists like Turner, Cezanne, Van Gogh, Picasso, Kandinsky, Delaunay, Malevich, Mondrian and Matisse. The huge category of Abstract Art sits under the umbrella of Modern Art and has been a key artistic movement of the twentieth century. Today it’s still an influential force as new interpretations are presented in Post-Modern Art. Abstract Art seems to fall into at least several different genres. Tell us a little about them. Abstract Expressionism, with vanguard artists like Arshile Gorky, Jackson Pollock, Willem de Kooning, Robert Motherwell, Hans Hoffman, Joan Mitchell and Helen Frankenthaler, is characterised by the predominance of organic forms of expression. Geometric and Lyrical Abstract Art, encapsulating total non-objectivity, is often simplified, as the work of Sol LeWitt and Clyfford Still shows. Colour Field (Mark Rothko) and action paintings are part of Abstract Art. Even representational work today is often abstracted in some way, with truly representational art being somewhat rare. More recent Abstract Expressionist artists doing great things are Cy Twombly, Sean Scully, Anselm Kiefer and Gerhard Richter and Australians Idris Murphy and Elizabeth Cummings. It’s kind of nice to think about Abstract Art in the context of how and why it developed. In 1905 Einstein’s paper on Brownian Motion identified atoms and molecules and states of constant agitation. This was met with great excitement by the artistic community. Agitated strokes were suddenly no longer controlled by forms! Prior to this, Gustav Eiffel’s Tower suddenly allowed the masses to look down on a landscape from above – a whole new perspective. As well, advances in astronomy affected the way we looked at things. Think Vincent’s galaxies: The Starry Night. Trains took people far distances at great speeds; this blurred the countryside inspiring the Futurists. The camera was invented and could reproduce or represent what the artist had traditionally tried to do. Industrialisation and the rise of the middle classes meant vast new art markets with increased purchasing powers. Now add to all this the chaos, depersonalisation, anarchy, futility and destruction of two World Wars, the Spanish Civil War, the Great Depression, the Holocaust and the dropping of the atom bomb and suddenly, the human condition becomes very important. The tone was melancholy. Times were hard; then in the late 1940s, French philosopher Jean-Paul Sartre’s influential book Existentialism and Humanism (1946) was published in English. The setting had been created for individual action, to act by instinct and with personal responsibility and freedom. Think of those times! What a great recipe for “art” as an individual expression of the human condition. Modern Art and thus Abstract Art are not traditional painting. “Colours, shapes, painting strokes, composition, line, texture, patterns can be enjoyed independently from their representational function,” said Terrence Maloon (King Street Gallery, Sydney) in the 2017 Elizabeth Cummings Exhibition Catalogue. This is a great way to think about Abstract Art. Throw into this mix the thoughts of Matisse. Jack D Flam (Matisse on Art (1995)), cites the artist: “…it is not that you have only to copy it … painters with nothing to say copy quite stupidly; they are boring and useless.” Strong words from the great master making the case for Abstract Expressionism. Matisse also commented, “Intellect and imagination take over from reproducing camera-like images of what they see … Painting and drawing (should be guided by) the profound feelings of the artist before the objects he (or she ) has chosen.” And “the painter arrives at signs for objects.” Wow! I bet this questions your thoughts on what constitutes a good drawing. Abstract Expressionism dispenses with many of the traditionally sanctioned aspects of painting – like the scientific view of perspective, the single fixed point of view, the vanishing point of diminishing sizes, painting only in the studio – paint became available in tubes allowing artists to paint en plein air (how revolutionary! ), and the realistic representation of the perceived reality of man and nature. Abstract art lets your imagination run free. It opens up a whole range of possibilities! 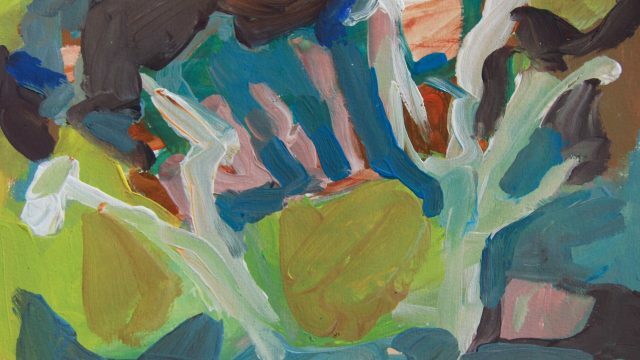 How should viewers look at an abstracted painting? First, do you like it? Do you like to look at it? If so, then think about what the artist may be trying to say or what you think this painting is telling you. Then look at whether the artist has achieved a situation of harmony in the painting, so look at colour, composition, balance. Is the painting static or dynamic? Is there movement or tension? Is it a calm painting? Are there open planes of colour with line to give some kind of form? Is there light or dark or is there an arbitrary open colour pattern? Look at the volumes and also the negative spaces. Do they seem to balance? Is there brilliance? Colour intensity? How has this been achieved? Has the artist contrasted cool colours beside warm colours? Consider colours or lack of colours. If there are lines or forms, are they soft or sharp, thin or thick, curved or straight? Or better still, is there a combination of these things? Look at the patterns of strokes. Do they vary? So many of these criteria for assessing an abstract painting overlap with assessment criteria for a realistic/representational painting. You see, talent does come into it. Let me tell you, painting abstractly is rewarding work by its very process, but it’s also very hard work. There is absolutely nothing easy about pulling an abstract painting that works! Let’s look at this landscape and apply the criteria. First, the image is evocative of a landscape and even though just about every feature has been imagined there are plenty of hooks to real representation. Pure abstract, non-objective painting is hard! We’re invited into the image by the fish-like or fluvially eroded rocks in the lower left; then the oblique figures take the eye up to the yellow light patches, across to the top of the right-hand side and out. Cloud-like shapes help direct this. The top left is in shadow and perhaps doesn’t achieve the attention it should. One figure faces the opposite direction to the group as a counterpoint to help with balance. Warm and cool colours are placed near each other in an attempt to make colour forms sing. There’s some glazing of translucent pigments like French ultramarine to unify the area in shadow. Thickness of line varies; it’s graphic in parts and busy. The image isn’t restful but it’s interesting – there’s plenty for the viewer to discover. Repetition of shapes is evident in the large central yellow patch and inverted off-white patch below; and see the rounded point rocky-looking mountain at top right and the smaller yellow shape on the left. The second large yellow form helps pull the centre forms to the right so the image isn’t too centrally focused, despite the strong vertical accentuating the height of the imagined landscape. All this helps balance the picture. The construction of the image nearly nicely falls into six planes – a centre horizontal with three sections top and bottom, either side of the centre line. It’s not the most creative composition but it suits the purpose of this picture. There’s also a limited acknowledgment of the Golden Mean Ratio. And I like looking at it! To summarise: Abstract Expressionism and indeed Art in general can liberate the soul. It satisfies the creative impulse to feed the spirit and sustain the health of the individual. Abstracted Art allows the landscape artist to do more than exhibit a harmonious spatial arrangement of features and feeling. It allows the artist to put into action that total human consciousness to produce something from the soul. In these times of self-centred existence it is no wonder that Abstract Art and abstract artists like me, are still flourishing. Anne Spencer is a Sydney-based artist whose artwork has continued to sell solidly since her first exhibition “Luminosity” in 2005. 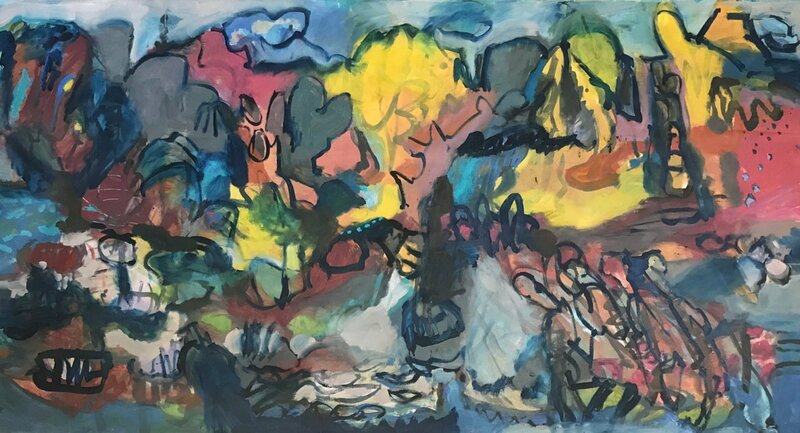 Her next exhibition “Imagining Landscape” will be at the Janet Clayton Gallery, Paddington in January 2018.